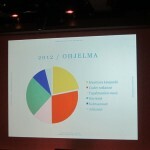 Most of the Helsinki World Design Capital 2012 programme was announced today and this will help us to focus the activities of Alternative Design Capital. The details of the programme can be found from this pdf (6MB, available in Finnish only at the moment). 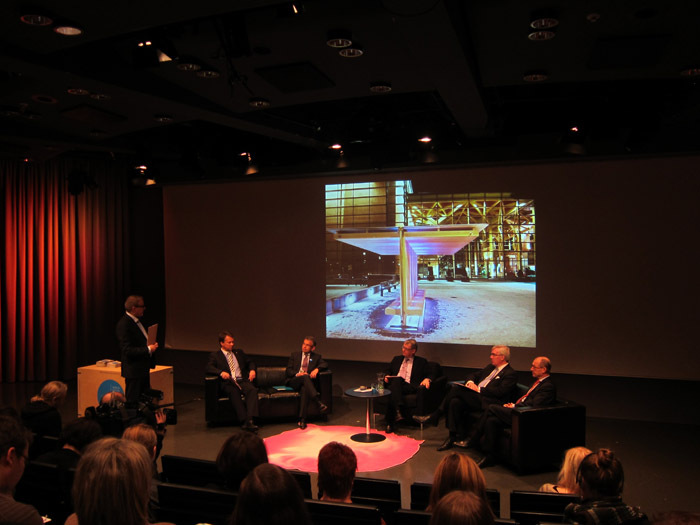 What became clear from the official announcement event was that the cities themselves want to open up and in the context of Helsinki WDC they have initiated many projects that they wouldn’t normally be engaged in. This is very positive. 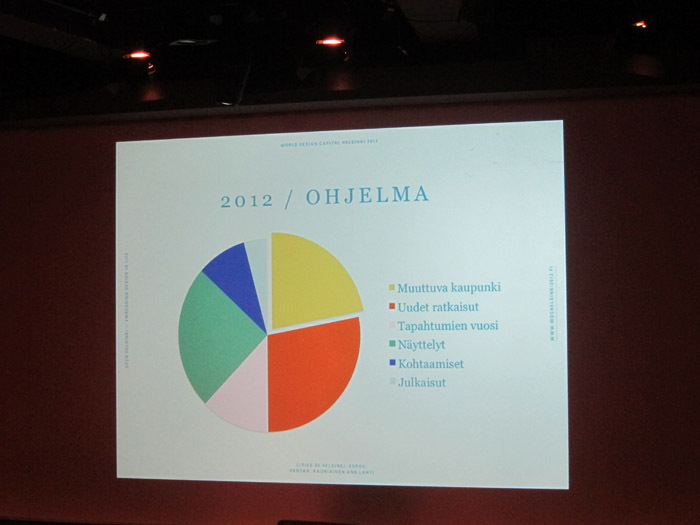 It’s also positive that the project brings together cities of Helsinki, Espoo, Vantaa, Lahti and Kauniainen. The mayors of these cities were the main stars of the event and they gave their own quite distinct views on Helsinki WDC project. 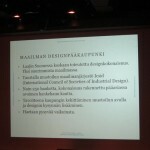 The main problem of Helsinki WDC can be found by studying the programme pdf in more detail. A great majority of all the contact persons mentioned are from big institutions: cities, universities, libraries and big companies. Many of these projects also involve small companies, non-profit organisations and individual people, but it is the big institutions who have the upper hand in the process and it is them who also get the main credit. So, for ADC it’s important to focus on supporting small, independent initiatives and voices. 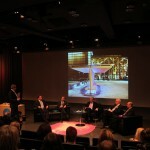 I also appreciated the comments given by mayors of Espoo (Jukka Mäkelä) and Vantaa (Kari Nenonen). 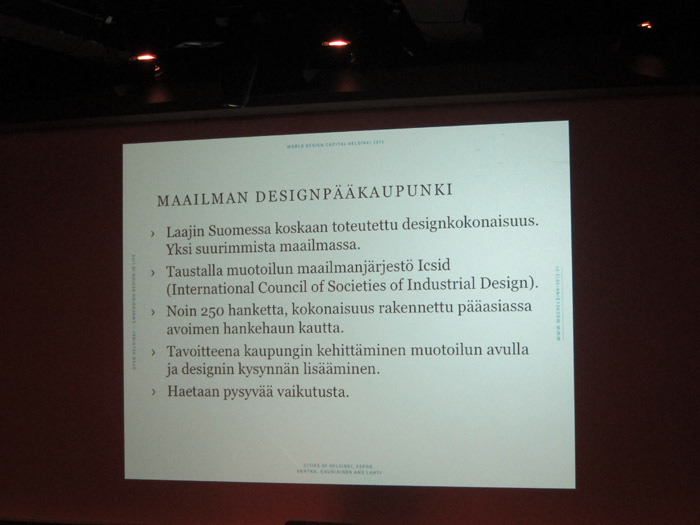 Jukka Mäkelä said that Helsinki WDC should engage the citizens better and also should aim for stronger and bolder visions in terms of city planning, involving the best designers. He was referring to the time when car-free Tapiola garden centre was planned in 50s and 60s – that we should think how this vision should be upgraded to correspond to today’s world. 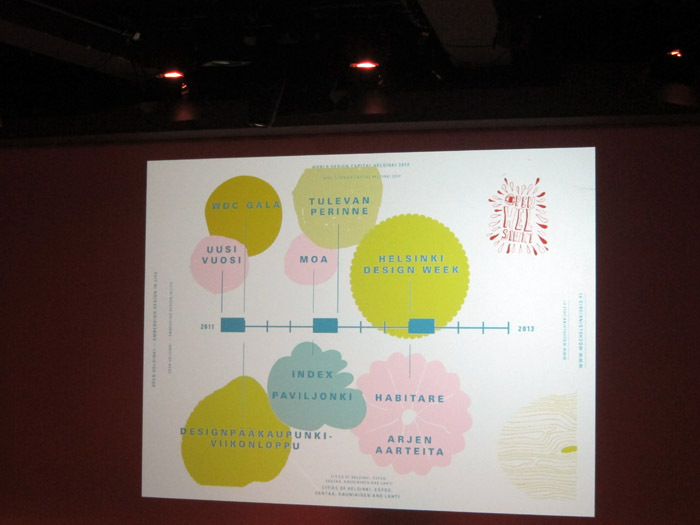 Concerning the design challenges in Vantaa, Kari Nenonen dared to mention also issues that are not easy and positive, such as high unemployment rate, segregation and ‘syrjäytyminen’, the fact that for various reasons many people have become isolated from the society. These are examples of complex problems that cannot be fixed with a single design solution but require a lot of collaboration between various actors in the society. 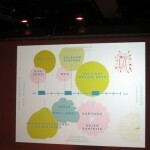 « Information wants to be free, but on the other hand…	» The new era of ‘non-disciplinarity’?